Washington’s Ty Rose watches the flight of his tee shot during a non-conference tri-match against Miami Trace and Chillicothe Wednesday, Aug. 22, 2018 at the Club at Quail Run. Justin Marshall chips onto the green for Miami Trace during a non-conference tri-match with Washington and Chillicothe at the Club at Quail Run Wednesday, Aug. 22, 2018. 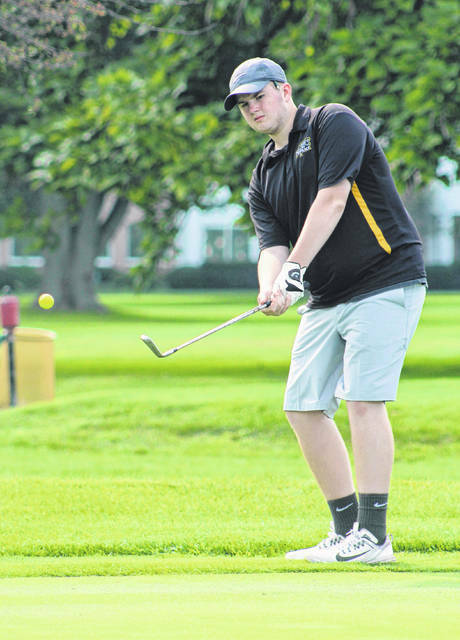 The Frontier Athletic Conference held its third boys golf match of the 2018 season Thursday, Aug. 23 at the Buckeye Hills Country Club near New Martinsburg. McClain won the event with a team total of 169. The Tigers’ Trevor Newkirk was the medalist with a score of 36. Hillsboro shot a 177, led by Kristin Jamieson with a 42. Jackson had a team score of 181. The Ironmen were led by Ethan Mercer’s score of 40. The Cavaliers of Chillicothe High School shot a team score of 190. Daniel Haller led the Cavs with a 43. Miami Trace had a team score of 195. The Panthers were led by Hayden Walters with a 40. Washington shot a team score of 210. Ty Rose and Brock Morris were low for the Blue Lions, each with a 48. Other scores for Miami Trace: Tyler Eggleton, 43; Trenton Crawford, 52; Justin Marshall, 60; Dawson Wallace, 67; Dalton Marshall, 70. Other scores for Washington: Tyler Rood, 55; Sam Shaffer, 59; Caden Holt, 68. Other scores for McClain: Kobe Penwell, 43; Trenton Newkirk, 43; Seth Wise, 47; Zane Mustard, 50; Carson Spangler, 60. Other scores for Hillsboro: Gavin Puckett, 43; Will Kiefer, 45; Gabe Mycroft, 47; Brennen Priest, 51; Ryan Harless, 61. Other scores for Jackson: Aidan Massie, 46 ; Traise Speakman, 47; Cooper Donaldson, 48; Carson Strange, 56; Caleb Rose, 57. Other scores for Chillicothe: Eli Taylor, 48 ; Cuay McGuire, 49; Luke Smith, 50; Matthew Madsen, 58; J.T. Kobel, 60. Washington and Miami Trace will host the FAC’s fourth match Monday at the Club at Quail Run at 4 p.m.
https://www.recordherald.com/wp-content/uploads/sites/27/2018/08/web1_Ty-Rose-Blue-Lion-golf-8-22-2018.jpgWashington’s Ty Rose watches the flight of his tee shot during a non-conference tri-match against Miami Trace and Chillicothe Wednesday, Aug. 22, 2018 at the Club at Quail Run. 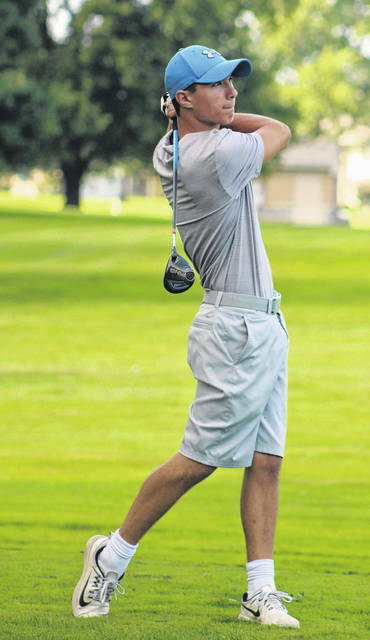 https://www.recordherald.com/wp-content/uploads/sites/27/2018/08/web1_Justin-Marshall-MT-boys-golf-8-22-2018.jpgJustin Marshall chips onto the green for Miami Trace during a non-conference tri-match with Washington and Chillicothe at the Club at Quail Run Wednesday, Aug. 22, 2018.